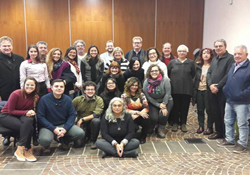 The event, which was coordinated by the Health and Social Agency of the Emilia-Romagna Region, was part of the ongoing collaboration between the Emilia–Romagna Region in Italy and Brazil. During the workshop, Dr Francesco Zambon, Coordinator, Investment for Health and Development in Healthy Settings, WHO European Office for Investment for Health and Development emphasized the importance of collaboration between regional actors and international health institutions in promoting well-being and reducing health inequity in line with the objectives of the WHO Regions for Health Network (RHN). develop relevant soft skills, methodologies and tools. It follows the logic of reciprocal and mutual learning, based on the concepts of horizontality, equity, collaborative effort and trust, and encompasses the principles and values of strengthening comprehensive, universal health care. Accordingly, the methods adopted – deep immersion in each other's contexts (local social and health-care services, health-related training institutions) and the realization of joint initiatives on the development of technical knowledge and abilities – enhances participatory dialogue and peer exchange between students, researchers, health professionals and policy-makers. This cooperation involves a wide range of players and institutions, including the Direction of Health and Welfare, the International Cooperation Sector, the Health and Social Agency, the University of Bologna and the University of Parma of the Emilia–Romagna Region in Italy, and the Primary Health Care Department of the Ministry of Health and numerous universities and health institutions located in eight of the States of Brazil. In 2017, the Laboratory started a feasibility study to support the development and improve the quality of intermediate care and community hospitals. The main goal is to analyse the model adopted in the Emilia-Romagna Region, and discuss its potential adaption to the context of the Brazilian primary health care services. This initiative contributes at the same time to strengthening the policies and strategies of the Emilia-Romagna Region and to improving the skills and competencies of health professionals. The study is the first concrete step taken within – and supported by – the newly established strategic intersectoral collaboration between the Direction of Health and Welfare and the International Cooperation Sector in the Emilia-Romagna Region. increasing understanding of regional and local health systems (exchange of experiences).